Cristiano Ronaldo’s Juventus are now out of the Champions League after a great performance of Ajax at Turin in the second leg of the quarter final. Ajax won the match with a margin of 2-1(aggregate scoreline 3-2 in favour of Ajax). It was a mesmerizing night for the youngsters of Ajax to demolish Cristiano Ronaldo and Co at their own den. The first leg of this tie ended with a scoreline of 1-1. At the first half of the match Cristiano Ronaldo scored the first goal of the match for Juventus. It was brilliant header from the corner taken by Miralem Pjanic. However, the Dutch side equalised soon with a brilliant goal of Van De Beek. The ball was provided by Ziyech and it was brilliantly placed into the Goal by Van De Beek. The first half ended with a scoreline of 1-1 at Turin. In the second half of the match, Juventus continued to play their defensive football. On the other hand, Ajax started to display their own kind of gameplay with which they completely dominated Juventus in the second half of the match. De Ligt’s thumping header at the second half from the corner taken by Schone gave Ajax the all important second away goal of the match. Juventus failed to make a comeback from that point in the match. 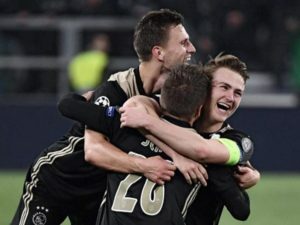 As a result of it, Ajax went through to the semifinal of the Champions League this season. Twitter erupts to congratulate India on their famous win at Adelaide!